A railway gun, also called a railroad gun, is a large artillery weapon, built on, transported by, and fired from a specially designed railway wagon. Many countries have built railway guns, but the best known were made by Krupp and used by Germany in World War I and World War II. Smaller guns were often part of an armoured train. Railway guns are no longer used. Their large size and limited movement made them easy targets. They have been replaced by aircraft, rockets, and missiles. The first railway gun used in battle was a banded 32-pounder Brooke naval rifle. In the American Civil War it was mounted on a flat rail car and protected with sheets of iron. On 29 June 1862, Robert E. Lee had the gun pushed by a locomotive over the Richmond and York River line (later part of the Southern Railway) and used at the Battle of Savage's Station. 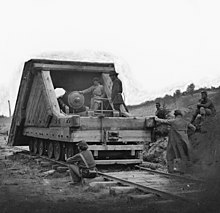 There is also a photo of a Union 13-inch siege mortar mounted on a rail car during the Siege of Petersburg, Virginia. It was nicknamed the Dictator or the Petersburg Express. Railway guns were used by France during the Siege of Paris in 1870, and by the British during the Siege of Ladysmith during the Second Boer War. Germany already had a few Big Bertha guns at the start of the First World War but the French had a shortage of heavy field artillery. Large coastal defense guns and naval guns were moved to the front. These were usually unsuitable for field use and needed some kind of mounting. The railway gun was an obvious solution. By 1916, both sides were using railway guns. Baldwin Locomotive Works made five 14"/50 caliber railway guns on trains for the United States Navy during April and May 1918. Each train carried a Mk 4 14"/50 caliber gun. These were a 14 in (360 mm) naval rifle used on New Mexico and Tennessee class battleships, mounted on a rail carriage with four 6-wheel bogies. One of these guns is on display outside the museum at the Washington Navy Yard. The Second World War saw the final use of railway guns. The Germans used the massive 80 cm (31 in) Schwerer Gustav gun, the largest artillery piece to be used in battle. The rise of the aeroplane effectively ended the use of the railway guns. Like battleships, they were big, expensive, and easily destroyed from the air. A 12 inch railway gun is at the Naval Surface Warfare Center Dahlgren Division, Dahlgren, Virginia (see this link for an image and brief description). A US Navy 14"/50 caliber railway gun from World War I is at Washington Navy Yard, DC. A German Krupp K5 gun ("Anzio Annie") is on show at the United States Army Ordnance Museum. It was made using parts from two German guns that shelled the Anzio beachhead. They were partly destroyed by their crews before being captured by the Allies. A second K5 can be seen at the Battery Todt museum, near Audinghen in northern France. Soviet era 305mm MK-3-12 guns are on show at the Krasnaya Gorka fort near Lomonosov, Russia, and the Museum of Railway Technology, Saint Petersburg. Soviet ТМ-1-180 180mm guns may be seen at Krasnaya Gorka fort, the Museum of the Great Patriotic War, Moscow and at Sevastopol Railway Station in the Ukraine. The last surviving American-made Bethlehem 177 coastal railway gun is on show at Museu Militar Conde de Linhares in Rio de Janeiro, Brazil. ↑ The United States Naval Railway Batteries in France. Navy Department, Office of Naval Records and Library, Historical Section. Publication Number 6. Washington, Government Printing Office, 1922. Arnold, Colonel B. E. (1982). Conflict across the Strait: A Battery Commander's Story of the Kent's Defences 1939-45. Dover: Crabwell Publications / Buckland Publications. ISBN 0-906124-06-9. Breyer, Siegfried (1973). Battleships and Battle Cruisers 1905-1970. Garden City, New York: Doubleday. ISBN 0385-0-7247-0-3 Check |isbn= value: length (help). Hogg, Ian V. (2005). Allied Artillery of World War One. Crowood Press. ISBN 1-86126-712-6. Jäger, Herbert (2001). German Artillery of World War One. Crowood Press. ISBN 1-86126-403-8. Lewis, Emanuel Raymond (1979). Seacoast Fortifications of the United States. Annapolis, Maryland: Leeward Publications. ISBN 0-915268-28-2 Check |isbn= value: checksum (help). Many, Seymour B. (April 1965). He Made No Complaint. United States Naval Institute Proceedings. Phillips, Lance (1965). Yonder comes the Train. Cranbury, New Jersey: A.S. Barnes and Company. ISBN 0-498-06303-8. Westing, Fred (1966). The Locomotives that Baldwin Built. Bonanza Books. Wikimedia Commons has media related to Railway guns. "When Artillery First "Took to the Rails"
"Railwaygun Web Museum". Retrieved April 21, 2005. This page was last changed on 31 August 2017, at 10:25.